Pai Gow Poker is an adaptation of a Chinese gambling game that was played with tiles. Pai Gow Poker is played with cards and uses poker hand rankings to resolve wins. 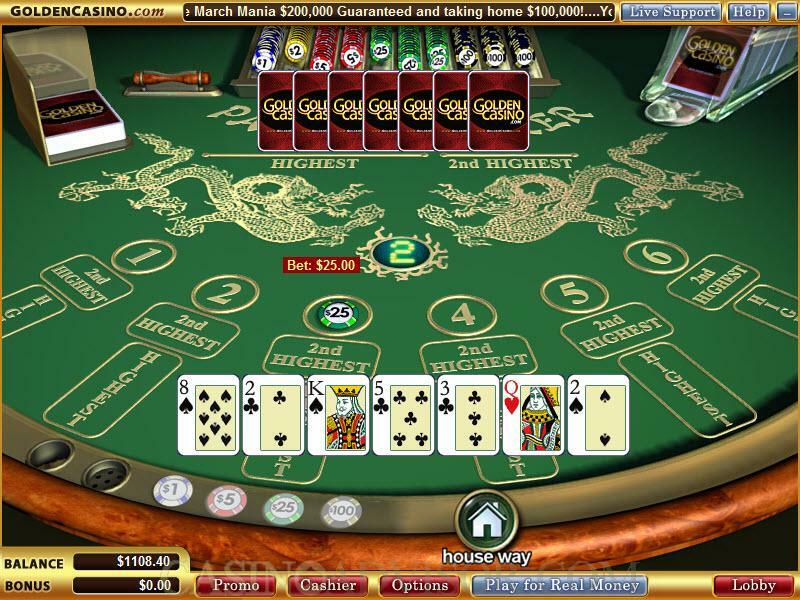 The screen shows a casino table with an ornate Chinese design and with the online features built in. The player’s balance is shown at the bottom left corner and just above that are the chip denominations to choose from. Though the table shows six player locations it is not a multi hand game. The player can choose any one location of his preference. The buttons for the player’s moves appear at the bottom right of the screen. Only the buttons relevant for that point in the game are visible. The player places the bet by clicking the chip(s) of the appropriate denomination and then clicking any of the six playing areas. Bets can be withdrawn one chip at a time by right clicking on the chips wagered. Using the Clear button all chips can be cleared. 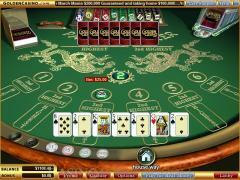 By clicking the Deal button the player is dealt seven cards face up and the dealer is dealt seven cards face down. The player has to bifurcate his hand into a five card high hand and a two card low hand. The high hand is also known as the highest hand and the low hand is also known as the second highest hand. This is done by left clicking on the two cards the player wants in the low hand. If the player makes a sub optimal decision or violates the rules then the software issues a prompt message. There is a special button called the House Way, which makes the optimal decision for the player. After the player makes this decision he clicks on the Done button. The player’s hand is separated and simultaneously the dealer’s hand is also bifurcated. The high hands are compared with each other and the low hands are compared with each other and the payout if any is made. If the player wants to continue with the same bet then he should click the Rebet button. The cards from the previous deal are removed and a fresh bet is placed. If the player wants to change his wager then he should click on the Clear button and start afresh. The background sound is a peppy music tune. The game sounds are the sounds of the cards being dealt and the dealer’s announcements of the instructions to the players and the announcement of the results. If the animations are enabled then the cards are dealt from a shoe. Otherwise they just appear on the table. Interested in reading more detailed information about Vegas Pai Gow Poker? If so Click Here for more details.